Like people, animals also have souls and were created in the preexistence. Not only were their roles determined, but they even partake of the Plan of Salvation. Like men they will also have the opportunity to enjoy the companionship of their creator in the next life, though they can never enjoy eternal life in the true sense that people can. 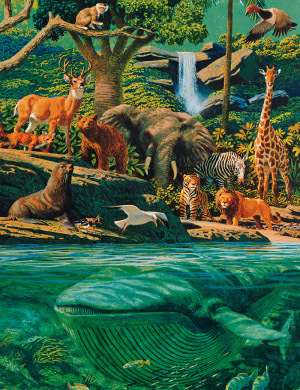 Christ's atonement covers all living things, including animals and plants. The duty of animals is to "fullfil the measure of their creation." “I do not believe any man should kill animals or birds unless he needs them for food, and then he should not kill innocent little birds that are not intended for food for man. I think it is wicked for men to thirst in their souls to kill almost everything which possesses animal life. It is wrong, and I have been surprised at prominent men whom I have seen whose very souls seemed to be athirst for the shedding of animal blood. Brigham Young taught that it would be strange not to have animals in the next life. Likewise they will also be present in not only the Telestial Kingdom, but also in the Terrestrial and Celestial Kingdoms. No specific doctrine is given specifying the station of animals in the afterlife, but they are universally saved through the Atonement of Christ. Says one, "I cannot believe in the salvation of beasts." Any man who would tell you that this could not be, would tell you that the revelations are not true. John heard the words of the beasts giving glory to God, and understood them. God who made the beasts could understand every language spoken by them. The four beasts were four of the most noble animals that had filled the measure of their creation, and had been saved from other worlds, because they were perfect: they were like angels in their sphere. We are not told where they came from, and I do not know; but they were seen and heard by John praising and glorifying God. This page was last edited on 30 August 2010, at 16:45.